A quitclaim deed, according to the prerequisites for transfers as defined under section 706.02 (1) of the Wisconsin Annotated Statutes, needs to identify the parties, the land, and the interest conveyed along with any material terms or conditions. The grantor's signature is needed in order to record a quitclaim deed. If the conveyance alienates any interest of a married person in a homestead under Sec. 706.01(7) of the Wisconsin Annotated Statutes, it must be signed or joined in a separate conveyance on behalf of each spouse. The Register of Deeds can refuse to record a quitclaim deed unless specific standardization requirements are met. These standardization requirements are further explained below according to county. The first recorded quitclaim deed will have priority over later recordings involving the same real estate. 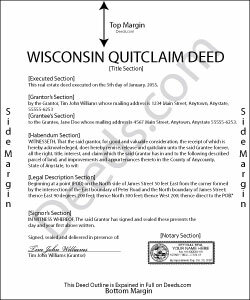 The Wisconsin Annotated Statutes 706.08(1) permit that if a quitclaim deed is not recorded, it is "void as against any subsequent purchaser, in good faith and for a valuable consideration, of the same real estate or any portion of the same real estate whose conveyance is recorded first". This is known as a race-notice statute recording act, which does not create a criminal penalty for not recording, but is meant to provide incentive to record.